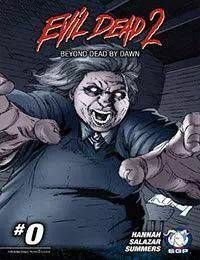 Evil Dead 2: Beyond Dead by Dawn #1 picks up right where Sam Raimi and Bruce Campbell's movie left off. “Dead” Annie Knowby gets plunged into Hell. Armed with the Kandarian Dagger and the Ex-Mortis, Annie fights off hordes of Deadites (and Ash's severed hand!) in her quest to save her parents souls! But will the book and the dagger be enough?